Network Attached Storage (NAS) servers have long since become a popular solution for reliable and convenient data protection and storage. Ranging from modest home solutions to enterprise-level offerings with versatile features, they can fit the needs of small to large businesses and individuals. QNAP Systems, Inc. is one of the key players in the NAS market offering a wide range of reliable, fast, and easy-to-operate products. QNAP NAS devices can be used to store anything ranging from media files to confidential business data. NAKIVO decided to partner with QNAP to create a game-changer in the area of VM protection – a DIY VM backup appliance. Now, instead of using your NAS as a mere backup storage, you can install NAKIVO Backup & Replication directly on this server and get a useful device with optimal performance and other unbeatable benefits. Purpose-built backup appliances (i.e., sold by a single company as a bundle) available on the market are 2-in-1 solutions that combine backup software with backup storage. In contrast, a VM backup appliance you can build by installing NAKIVO Backup & Replication on a QNAP NAS is a 5-in-1 high-performance solution (that is hardware, backup software, storage, deduplication, and backup to cloud in a single box). Moreover, purpose-built backup appliances limit your choices of software and hardware and usually cost more. In its turn, a combination NAKIVO Backup & Replication and a QNAP device lets you create a powerful VM backup appliance with the NAS you already have and, thus, pay up to 5 times less. Once created, the VM backup appliance can be used to make image-based, application-aware backups of your VMware and Hyper-V VMs and AWS EC2 instances. NAKIVO Backup & Replication can be installed on the majority of QNAP NAS devices, from the most economical to high-end. No matter which compatible NAS you choose, all the advanced backup, replication, and recovery features of the product will be available for use – and it won’t take more than a few minutes to configure. Having a VM backup appliance spares you the need to overload your primary production server with backup processes. You also won’t need any additional server with backup software running on it to serve as a relay point between VMs and the NAS. As previously mentioned, installing NAKIVO Backup & Replication directly on a QNAP NAS creates a 5-in-1 solution (backup hardware, software, storage, deduplication, and backup to cloud). You get a multi-functional physical device that can be relocated off-site and requires less maintenance and support, not to mention that it takes some load off your virtualized environment. When backup processes run on a QNAP NAS, production server resources (i.e., CPU and memory) can be used for running VMs. Having your VMs, backup software, and backup repository all in one place poses significant risks. Any kind of failure can compromise the VMs, backup jobs, AND the VM backups that could be used for recovery. Therefore, separating your backup software and storage from the main production server will make sure your backup jobs run as planned, even if the main virtual infrastructure takes a hit. It will also ensure you have VM backups ready to run VM recovery jobs whenever you need them. With a QNAP-based VM backup appliance, VM backups are faster by default, as NAKIVO Backup & Replication writes them directly to NAS disks, bypassing CIFS and NFS network protocols. The speed can be increased even further thanks to Network Acceleration, LAN-free data transfer, and simultaneous backup, replication, and recovery jobs. As a result, you can get up to a 2X speed boost as compared to purpose-based backup solutions. NAKIVO Backup & Replication uses several technologies to consume less storage space. VM backups are forever-incremental, meaning that only changed data blocks are transferred with every backup job. These blocks of data are further deduplicated and compressed to save even more space. Also, with the space reclaim technology, you can rearrange the blocks in the storage to use the latter with the greatest efficiency. Even an offsite VM backup storage can be compromised, which will put your VM backups under risk. NAKIVO Backup & Replication prevents this by copying VM backups to another repository or directly to AWS or Azure clouds. Backup copy jobs are easily scheduled to meet individual needs. To make sure VM backups are error-free and usable, NAKIVO Backup & Replication includes the screenshot verification feature. After finishing a backup job, NAKIVO Backup & Replication will test-recover the VM, make its screenshot, and send it to you via email. This way, you will always know whether your backups are valid and can be used for recovery. When the disaster strikes, get your virtual infrastructure back to normal in no time. NAKIVO Backup & Replication allows recovering VMs, files, and Microsoft Exchange, Microsoft SQL, and Microsoft Active Directory objects directly from deduplicated and compressed backups on the QNAP NAS server. Check if your QNAP NAS model is supported. 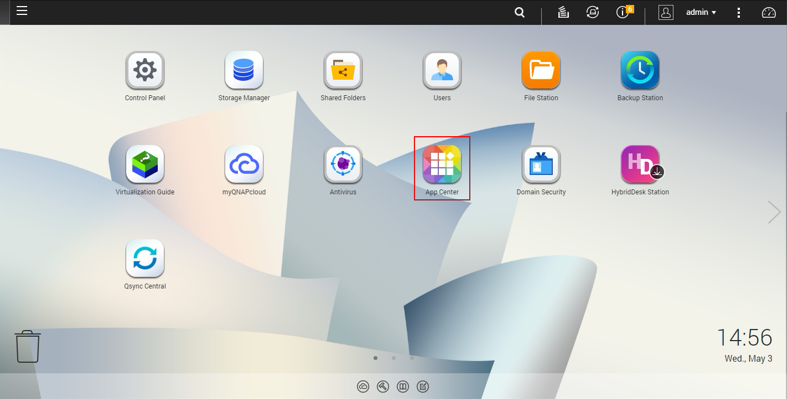 Open the QNAP Desktop in your browser by entering the IP address of your QNAP NAS. Use the search bar to find NAKIVO Backup & Replication or look under Backup/Sync. In the appeared window, click Install again. NAKIVO Backup & Replication is now installed on your QNAP NAS and ready to run VM backup, replication, and recovery jobs. NOTE: By default, NAKIVO Backup & Replication interface can also be found at the IP address of your QNAP NAS on port 4443: https://<IP_address_of_QNAP_NAS>:4443. Alternatively, you can download the QNAP package from the NAKIVO website and install it manually via App Center. Creating a VM backup appliance is a smart and strategic decision in line with the current technological trends. When you use a QNAP NAS and NAKIVO Backup & Replication to create such an appliance, you combine solid and reliable hardware with cutting-edge, multi-functional virtual machine backup software. With up to 2X better performance and 5X cost reduction, a VM backup appliance can become an indispensable part of your virtual infrastructure, offering convenience, reliability, and reduction of costs. Download the full-featured Free Trial of NAKIVO Backup & Replication and install the product on your QNAP NAS to build your own VM backup appliance. You can also request a Live Demonstration of the product. VMworld 2017 Europe: NAKIVO Rocked!